KL, Nov 14: When it was clear that the floods that hit Penang early this month were severe - very severe - the DAP's political foes (i.e. Najib Razak-led BN) did the admirable thing of restraining themselves from politicising the issue. They could have hung the DAP State Government out to dry, condemn them for being irresponsibly ill-prepared for the inevitable [yes, inevitable, because all the signs were on the wall and the State Government ignored them!]. Instead, those BN fellows came to the distressed DAP politicians and their PKR sidekicks with help, supplies, even moral support. And they did so unconditionally, too. We saw photographs of DPM Zahid Hamidi and the PM himself going to the ground to meet the flood victims and the sorry Chief Minister Lim Guan Eng. Najib even asked all parties to stop politicising the Penang floods. 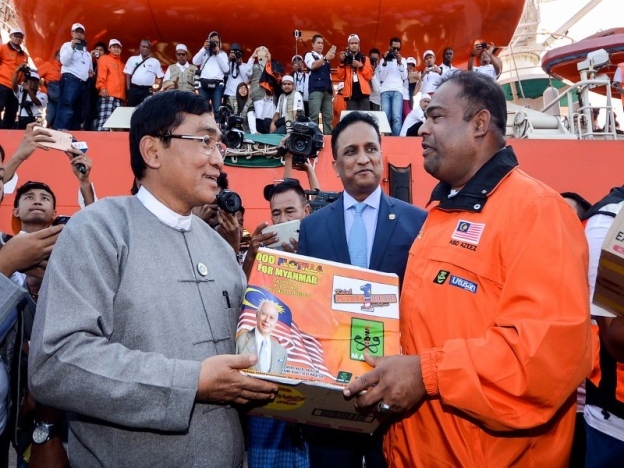 "... the focus now is on helping the people," he said on Nov 5. Read also: Najib: Providing aid to flood-hit states transcends politics. But the nature of ingrates is such. Ibarat melepaskan anjing yang tersepit, as the Malay saying goes, sudah lepas ia menggigit. 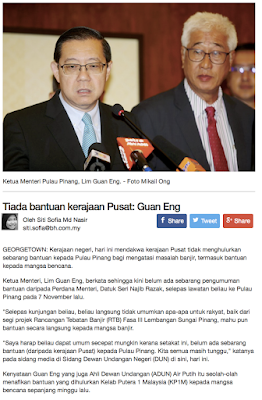 Dr Afif Baharuddin, a member of Guan Eng's Penang State Exco, is one such proverbial dog. 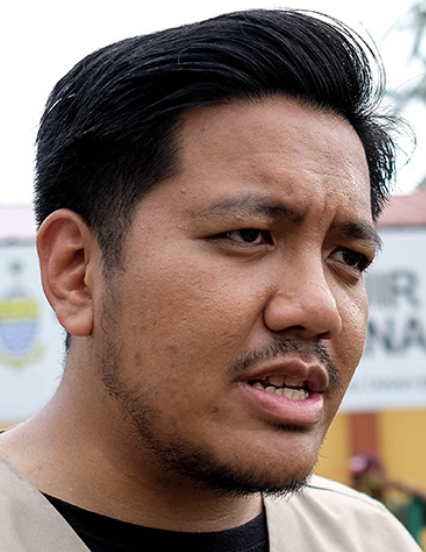 Perhaps because the worst of the floods seems to have passed, the PKR assemblyman and Youth leader is bent on turning it into a political circus. 1. flood relief for Penang had come three days late supposedly to coincide with the PM's visit. 2. the National Welfare Department failed to "stock up" the Penang state's Welfare Department in preparation for the monsoons. 3. one Federal Minister of paying in cash at a supermarket RM1 million worth of aid and supplies for the flood victims! 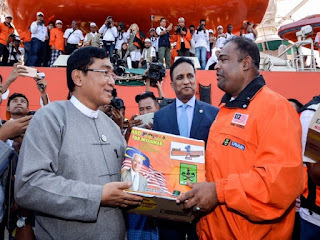 Most of all, Aliff wants to know where his counterpart in BN Abdul Azeez Rahim got the money to help the flood victims in a big way. Who is funding Kelab Putera 1Malaysia? "Don't tell me it's an Arab donor," he said, in an apparent swipe at Najib's RM2.6 billion donation from an Saudi royalty. What the hell is wrong with this dude? Guan Eng is dua kali lima, if Berita Harian's report yesterday is anything to go by. Read Tiada bantuan kerajaan pusat, [No aid from Federal Government]. YB Salleh Said Keruak, the Multimedia and Communications Minister, had warned us of such dogs, actually. In When politics come before the people, which he posted on his blog on Nov 12, the Sabah BN strongman said some politicians put the interests of their party above the people's; in other words, they are in politics not to serve the people but to attain power. "We get involved in politics as a means to seek a better Malaysia. And this means we need to put the people above politics," Salleh said. Latuk, it surprise me you are able to collect "sampah" news from Berita Harian that reporting Guan Eng saying no help from Putrajaya. This is pure rubbish news as LGE has never say such a thing as printed by garbage distributor like BH. Selangor state government has be abrilliant move to stop Utusan Meloya and BH because they are only good at spreading lies and half truth news. Hee hee, O Latuk, Latuk. You conveniently omit the comments of Zahid Komedi that the floods were a divine sign that Gelakan should retake Penang. Not "political" ke? Perhaps your latte blocked your view of that headline? Though I admire your strategic plug of Salleh Keruak, Latuk. Methinks you can soon afford to mysteriously acquire a Range Rover to go with the mysteriously acquired BMW *cough*, and drive said Range Rover to help victims of the next flood? Some repentance is in order, no?